There are a number of creams, oils, and home remedies on the market that claim to prevent the formation of scars and to minimize the appearance of old scars. The kind of scars that people are often interested in preventing or minimizing are hypertrophic scars. They are red and raised and can be painful or cause limited movement in the affected area (called a contracture). Hypertrophic scars usually diminish somewhat over time. So far, scientific support for the claim that any remedy can remove scars is lacking. Here's a closer look at one of the most popular remedies, vitamin E.
Vitamin E, or tocopherol, is a fat-soluble antioxidant. It's found in capsule or liquid form at drugstores, grocery stores, health food stores, and online. The oil is typically applied to the affected area. Vitamin E may penetrate the skin and reduce the formation of free radicals (which interfere with healing). Vitamin E also influences the production of collagen, a structural protein partially responsible for the strength and elasticity of skin. Although many people apply vitamin E oil to their skin to minimize or prevent scars and it's sometimes recommended by physicians after skin surgery, there's very little evidence that shows it helps to reduce wound scarring. A study published in Journal of Plastic, Reconstructive and Aesthetic Surgery in 2011 suggests that twice daily application of 5% vitamin E had no significant effect on the appearance of scars, compared to a placebo. Study participants started applying the vitamin E two weeks after surgery and continued twice a day for six weeks. Another study, published in the Journal of Burn Care and Rehabilitation in 1986, examined the use of topical vitamin E during the postoperative period after reconstructive surgery for people with burns. Study participants used either a topical steroid, topical vitamin E, or an inert cream. There was no beneficial effect of either vitamin E or topical steroid on range of motion, scar thickness, change in graft size, or cosmetic appearance. A small study published in Dermatologic Surgery in 1999 compared participants who had undergone skin cancer removal surgery. After the surgery (and when all wounds were primarily closed in two layers), participants applied vitamin E mixed into a cream to one part of their scar twice daily for four weeks and the cream alone to another part of their scar, also twice daily for four weeks. At the study's end, the vitamin E-enriched cream had no effect on, or actually worsened, the cosmetic appearance of scars. Of the study participants that were studied, 33% developed contact dermatitis to the vitamin E. The study authors concluded that topical vitamin E use should be discouraged. One criticism of the study is that too little vitamin E was used (one crushed capsule containing 320 IU of vitamin E was added to one gram of cream). Also, applying any substance to a wound too soon after injury can keep it from healing properly. In addition to the risk of contact dermatitis, topical vitamin E has also resulted in a skin reaction called generalized erythema multiforme reaction in a case report involving two patients. Patch tests with vitamin E oil showed positive local reactions in both people. Onion, or Allium cepa, is an ingredient in sometimes found in scar gels and creams. Onion extract has been found to have anti-inflammatory and antibacterial properties and regulate the formation of collagen. There have been three major clinical studies in the United States, however, and none have not found that it can improve hypertrophic scars. One study found that there was no difference in redness and itchiness after one month (three times a day) of onion extract gel. Another study evaluated 97 people with new or old scars who used either an onion gel or a placebo gel. After two months, there was no difference in scar size, overall improvement, noticeable appearance, elevation, redness, and softness when assessed by physicians. Honey has been used as a dressing for burns and wounds for centuries. In 2006, a review of 22 clinical trials involving more than 2,000 people found that honey had antibacterial and anti-inflammatory properties and could stimulate the growth of new tissue. Many of the studies, which were conducted at the University of Waikato in New Zealand, used a type of honey called manuka honey. Although honey is more promising as a wound dressing for skin ulcers and burns, there isn't enough evidence to suggest that it can help with hypertrophic scars. Other home remedies often used for scars, but again without reliable supporting evidence, are aloe vera, gotu kola, vitamin C, and zinc. 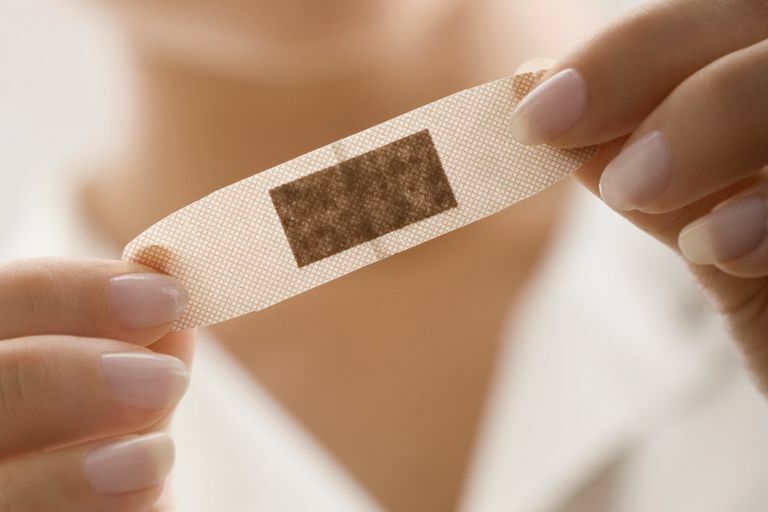 If you're considering the use of any type of alternative medicine for scars, make sure to consult your physician first. Baumann LS, Spencer J. The effects of topical vitamin E on the cosmetic appearance of scars. Dermatol Surg. 1999 Apr;25(4):311-5. Jenkins M, Alexander JW, MacMillan BG, Waymack JP, Kopcha R. Failure of topical steroids and vitamin E to reduce postoperative scar formation following reconstructive surgery. J Burn Care Rehabil. 1986 Jul-Aug;7(4):309-12. Khoo TL, Halim AS, Zakaria Z, Mat Saad AZ, Wu LY, Lau HY. A prospective, randomised, double-blinded trial to study the efficacy of topical tocotrienol in the prevention of hypertrophic scars. J Plast Reconstr Aesthet Surg. 2011 Jun;64(6):e137-45. doi: 10.1016/j.bjps.2010.08.029. Epub 2010 Sep 24. Klotz T, Kurmis R, Munn Z, Heath K, Greenwood JE. The effectiveness of moisturizers in the management of burn scars following burn injury: a systematic review. JBI Database System Rev Implement Rep. 2015 Nov 13;13(10):291-315. doi: 10.11124/jbisrir-2015-2450. Saperstein H, Rapaport M, Rietschel RL. Topical vitamin E as a cause of erythema multiforme-like eruption. Arch Dermatol. 1984 Jul;120(7):906-8.